Yellow Submarine (United Artists, 1968). Three Sheet (41" X 78.75") Heinz Edelmann Artwork. The Beatles got animated in this fanciful adventure as they set off on a quest to save the peaceful Pepperland from the clutches of the evil Blue Meanies. Although the Beatles - John Lennon, Paul McCartney, George Harrison, and Ringo Starr - weren't thrilled about the project at the beginning (they loathed the current television cartoon show about them), after seeing the finished film, with its Peter Max-inspired designs, they were extremely happy with it, and actually agreed to film a short live action epilogue. In addition to the title song, the soundtrack includes such classics as "Eleanor Rigby," "All Together Now," Lucy in the Sky with Diamonds," "Sgt. Pepper's Lonely Hearts Club Band," "All You Need is Love," and "When I'm Sixty-Four." The poster shows edge wear with small tears, mild fold wear and separations, creases, and pinholes in the borders. 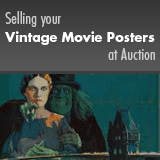 There are a few faint stains and smudges, but none of these issues greatly affect this colorful poster's display. Folded, Very Fine-.